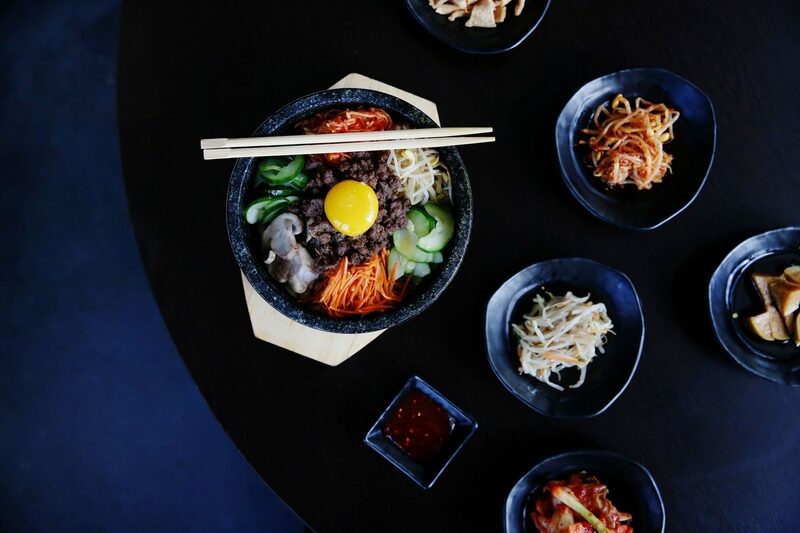 Korean food goes beyond kimchi, bulgogi and pork buns. The rich cuisine is packed with complex fermented pastes, grain dishes, dynamic chili powders, marinated meats and fish, and so much more. Next time you are craving Korean flavors, instead of heading out to eat, try making one of these intensely delicious recipes at home. The collection includes both traditional dishes and Korean-inspired creations. Chinese steamed buns are an unexpected treat; they're squishy, slightly chewy, and all-around wonderful. Look for them in the freezer section at Asian markets; aim for the folded buns, sometimes labeled lotus buns or Chinese hamburger buns. And if you can't find them, you can stuff the meatballs into standard slider buns. Chef Nyesha Arrington serves these crisp-edged, gently spicy latkes for brunch at her Venice Beach restaurant, Leona. They're great with a green salad on the side. This is a riff on the classic rice dish bibimbap, in which various toppings are arranged over a bed of rice. Here, Korean shrimp BBQ bowl must-haves such as matchstick-cut carrot, shredded cabbage, and pan-seared shrimp top brown rice. Here's a fun Korean spin on a classic Mediterranean appetizer. A drizzle of toasted sesame oil enhances the nuttiness of tahini (sesame seed paste) in this quick make-ahead dip, and rice vinegar stands in for the usual lemon juice. Kimchi gets blended into the hummus, where it adds a hint of savory pickled essence. It's also chopped and sprinkled on top for a burst of fermented pungency. Serve with sliced cucumbers, whole radishes, raw cauliflower florets, baby carrots, and rice crackers. This is my version of the lunch I enjoyed with my relatives. It is a specialty of the Hapcheon area--a soup take on the popular Korean dish bulgogi (grilled marinated beef). In Hapcheon, the soup was cooked on the table, and we monitored the cooking. At home, you'll need to watch closely so the broth doesn't boil; you want it at a bare simmer, or else the meat will get tough and the broth cloudy. You can buy kimchi from an Asian market or make your own. Most kimchi is fermented for days or weeks to develop a pungent flavor. Although this recipe skips the fermentation step, it tastes authentic. It's been a while since we had pajeon (literally translated pa=green onion/scallions and jeon=pancake, thus green onion pancake) since our California days with unlimited makgeolli (fermented rice wine). But for the sake of adding to our recipe list, we decided to make haemul pajeon (seafood pancake) for tonight while the kids spend the night at Komo's house (Auntie's). There are endless variations of this dish which can be made by adding or omitting certain ingredients according to personal preference. There are some great places in Korea that make this using fresh, whole seafood that is unbelievably delicious. I've tried to replicate it but to no avail. This dish also referred to as anju (alcohol-accompanied side dish) which is very popular in Korean restaurants and bars. The recipe below also includes a basic dipping sauce that can be made in minutes. Often fermented and aged (sometimes for months), kimchi is a spicy Korean condiment. It's traditionally served with steamed white rice and pairs well with stir-fries. A delicious combination of rice and vegetables, this signature Korean dish is worth the effort. As you prepare each component, place hot food on a jelly-roll pan and keep in a warm oven. These crispy seafood pancakes get a spicy tang from the kimchi that's mixed into the batter. To add more heat to the dish, thinly slice a hot chile pepper and add it to the dipping sauce. Easy to make and oh-so-tasty, Korean-Spiced Sticky Wings will make a splash at your next bash. Paper thin slices of beef seared quickly with garlic and soy. The trick to making the beef ultra thin is to partially freeze it making it easy to slice. These burgers are based on bulgogi, a traditional Korean barbecue specialty of marinated sirloin. If you prefer more authentic flavor, just top with a splash of rice vinegar and kimchi, the spicy-hot pickled vegetable condiment available at Asian markets. Serve with rice crackers.